Among film critics and cinephiles Douglas Sirk’s reputation has gone from that of a Universal mass-melodrama director-for-hire to one of a wry, dry and subversive social commentator. Led by the Cahiers du Cinema (particularly Godard’s) appraisal of his work, the German director was re-discovered by feminist and psychoanalyst theorists – notably Laura Mulvey – in the 1970s. And, of course, it was Rainer Werner Fassbinder who made Sirk popular again with the release of Ali: Fear Eats The Soul (1974) – a loose remake of Sirk’s All That Heaven Allows (1955). Today, a Sirk film – like Written on The Wind (1956) – has to be approached with fierce irony; it can’t be watched with complete earnestness or emotional integrity. The late Roger Ebert stated: “To appreciate a [Sirk] film like Written on The Wind takes more sophistication than to understand one of Ingmar Berman’s masterpieces, because Bergman’s themes are visible and underlined, while with Sirk the style [subversively] conceals the message.” And Ebert even added: “William Inge and Tennessee Williams were taken with great seriousness during the decade, but Sirk kids their Freudian hysteria.” If one indeed perceives Sirk ironically (and from rare interviews it seems to be how Sirk perceived his own work), then his work leaves no doubt that Sirk preceded by decades the post-modern, melodramatic satire of writers like Bret Easton Ellis, as well as mass-media, pop culture soaps like Gossip Girl or Keeping Up with the Kardashians. Sirk twisted meanings, played on double-entendres and magnified the very forms he attacked: the lush, exciting superficiality of colorful interiors and the gorgeous individuals who inhabit them. 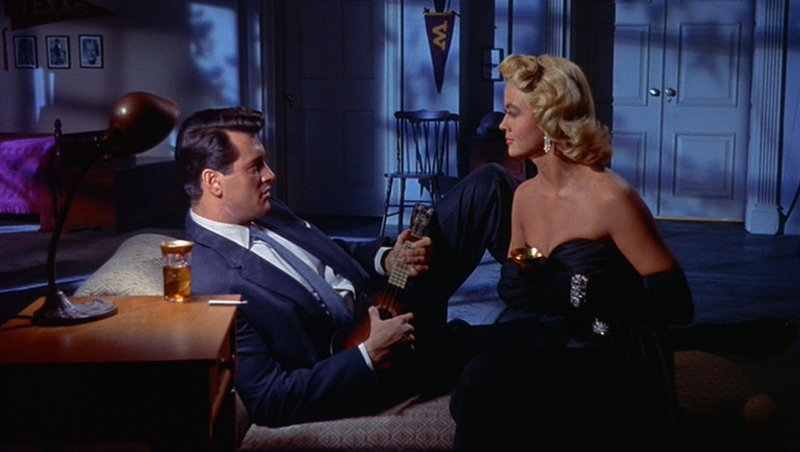 Sirk’s most iconic collaborator was his frequent male lead Rock Hudson. Today it seems Hudson’s name is associated with closeted homosexuality in Hollywood, but this legacy has obscured his talents as a one-of-a-kind movie star. Hudson’s persona was a hybrid between the pre-war romanticism of Cary Grant and the post-war edginess of James Dean. Each of the four Sirk/Hudson pictures – Magnificent Obsession (1954), The Tarnished Angels (1957), All That Heaven Allows and Written on the Wind – screening at BAM this weekend find Hudson oscillating between charismatic and mysterious, physical and emotional, vulnerable and volatile. Hudson was also the perfect catalyst for Sirk’s subversive irony. Due to his star’s good looks and all-American persona Sirk could ratchet up the ridiculousness of Hudson’s actions knowing that his core audience (almost exclusively female in the 50s) would keep watching. In last year’s Magic Mike, Steven Soderbergh used Channing Tatum’s persona (and its effects on teenage girls) similarly as a Trojan horse to conceal a critique of the excessive, shallow and empty nature of relationships in 21st century America. This neglect might be the backlash of Sirk’s re-evaluation, his profile converted from a director of super-sentimental women’s weepies to a European satirist. Why can’t he be both? Satire does not have to be exclusively critical; it does not have to neglect the plight of its characters. If anything, it can add an extra layer of engagement since those characters find themselves prisoners of their vile society or sometimes, even worse, of themselves. The Tarnished Angels – Sirk’s passion project and an adaptation of William Faulkner’s Pylon – is the most emphatic of his works, as well as the most atypical visually. A Sirk film usually means a crisp and vivid three-strip Technicolor, with subtle but elegant camera moves, sophisticated lighting set-ups with shades and scintillations, and a saturated color palette. But with The Tarnished Angels, Sirk shot black-and-white and focused on expressionism and contrast. The film is one of the few incarnations of the “noir-melodrama.” The most iconic amongst those cinematic hybrids is Curtiz’s Mildred Pierce (1945). An even earlier example of this association between a highly atmospheric look and affairs of the heart can be found in some of the “exterior” scenes of King Vidor’s Stella Dallas. In The Tarnished Angels, Hudson plays Burke Devlin, a journalist who becomes fascinated with circus drifters in the Great Depression. Deviln is a smart, middle-class well-read individual obsessed with those outsiders who live on the fringe of the American society. The film’s noir look adds a layer of anxiety and anguish to a word that seems suffocating for its main characters. In All That Heaven Allows and Magnificent Obsession – two films more representative of Sirk’s trademark aesthetics, both of which feature a romance between characters played by Hudson and Jane – the emotional engagement with the characters is less obvious precisely because it’s so “big.” Sirk’s visual and dramatic overstatement leaves little room for subtlety, and to a modern audience this florid array of feelings might be alienating or even unintentionally funny. But especially in the case of Magnificent Obsession, the melodrama is worth the ride, thanks to its splendid evocation of regret and longing. Sirk manages to express both the profundity of change and the unyielding endurance of the human spirit. The chemistry between the two leads is a rare one; it’s instantaneous. From the first frame Hudson and Wyman share together we can sense that these two human beings will connect, even if the characters don’t know it yet. Hudson is a confident romantic lead, perfectly counter-balanced by the more conflicted Wyman. The challenge with watching Douglas Sirk and Rock Hudson films today is honoring them, knowing how to enjoy both the subversion and irony of Written on The Wind and the touching love story of Magnificent Obsession; finding out how to marvel at both the expressionistic style of The Tarnished Angels and recognize the excessive and intentionally overstated (even heavy-handed) nature of the photography in All That Heaven Allows. BAM’s upcoming series offers us the chance to refine our perception of Sirk’s masterworks and go beyond the post-modern assessment of his filmography. By seeing them on the big-screen – as opposed to our laptop or iPads – we will be able to experience his pictures more viscerally, letting the colors, camera movements and dramatic close-ups drive our emotions as Sirk intended them to. “Magnificent Obsession: Douglas Sirk & Rock Hudson” plays this weekend at BAM Cinématek. Written by: Theo Zenou on April 19, 2013. Last revised by: Double Exposure, our reviewer, on April 22, 2013.